Once upon a time seven children from three different states came to visit their family in Pennsylvania. Some came from far away in a car, plane or train so they could see each other and get to know their grandparents and great-grandparents, who lived in the lush farmlands and wooded meadows of western Lancaster County. They liked too when Great Grandma would bring them warm strawberries from her patch in the spring time, and in the summer some ripe, pink-cheeked Bartlett pears from the tree planted near a gently flowing brook. Grandma loved trees and sometimes sat in the shade of a Japanese cherry tree as she rocked on the porch. She smelled the wisteria that twisted around a trellis close by and enjoyed the morning-glories climbing upon harp-like strings by the kitchen door. 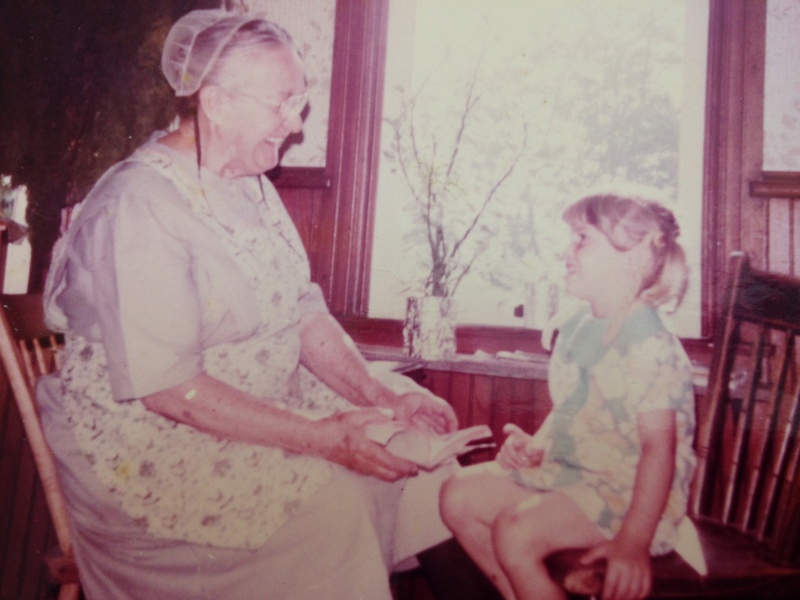 One sad June day in 1980, their great grand-mother died, so all seven young children ages 1 1/2 – 11 gathered near the small village of Rheems to say “goodbye” to their Great Grandmother Fannie Longenecker, who was 89 years old. Some of the children called her Grandmother-of-the-Birds because she loved hearing birds chirp and gave them seeds to eat in the winter-time. Great Grandma’s daughter, their Great Aunt Ruthie, loved trees too and when her mother died, she decided to plant an oak tree as a remembrance. All the children helped to plant the tree. Even the littlest one put some soil around the tree so the roots would be covered up tightly. The tree grew and grew for thirty-five years. Now it is very, very tall. Cardinals, robins, and nuthatches hop around in its branches at various seasons of the year. In the summer squirrels enjoy the shade it sheds over the lawn. The children visit Great Grandma’s house still, but they don’t often come at the same time now because they have grown up and have families of their own. When they do come, though, they can see how tall the tree has grown and imagine how deep the roots have spread out since they planted that tiny tree so many, many years ago. Like birds, they have flown away on strong wings . . .
Is there a tree of significance to your family? Where is it planted? What other images did you recall as you read this post? Make this into a children\’s book,quotes included. I\’m glad this post struck a chord with you, Shirley. I\’ll certainly consider your suggestion. It does read like a children\’s book! I love big old trees. 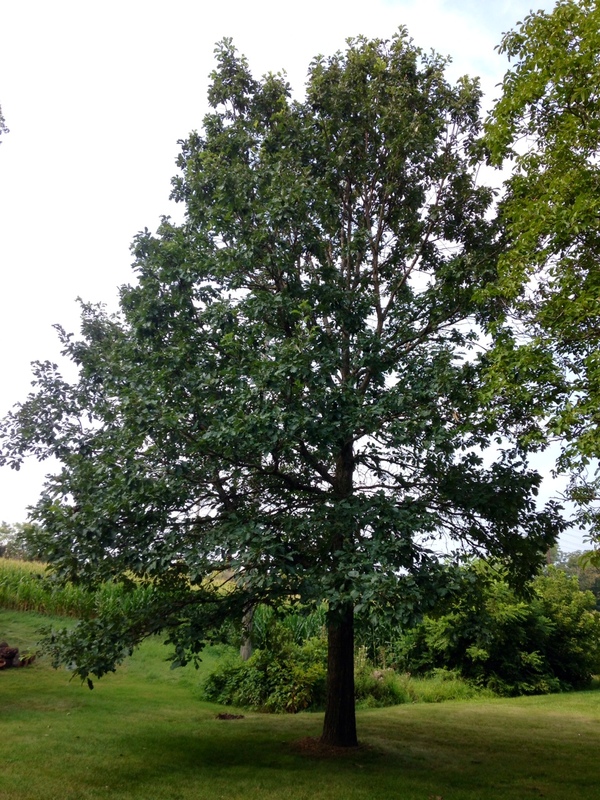 It\’s so wonderful that you can still see the tree planted in your great grandmother\’s memory. 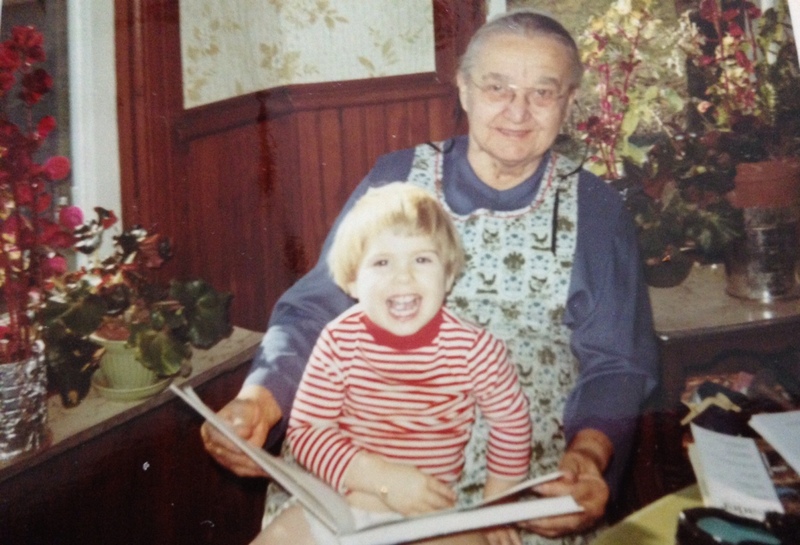 I love the photos of Crista and your great grandmother–such joy in their faces! We have many very old trees in our yard. I remember someone saying that our big old oak tree was over 100 years old–that was about 20 years ago. I wonder about its story. Oaks age well, a good metaphor for living, it occurs to me. Historian that you are, you may want to investigate the story of the oak in your back yard sometime. Yes, I\’m fortunate to be able to look about the kitchen window at Grandma\’s house still and remember . . .
Beautiful post, Marian. I love trees and birds also. Last time I visited the Home Place, I picked up two acorns. They are sitting in a pot. Maybe they will push up two new trees my grandchildren can enjoy in their old age. My favorite biblical tree reference comes from Revelations — \”and the leaves of the trees shall be for the healing of the nations.\” The Goshen College presidential medallion is a silver maple leaf with these words inscribed in back. Your comment inspired me to look up the reference from Revelation 22:2. Such inscriptions suggest ideas that are wide and deep. A mission statement for any institution with altruistic goals could certainly be derived from that verse. Thank you! Maybe you can have a tree planting ceremony too with Julia and Owen someday. If you do, you know we\’d love to read about it. Do enjoy your vacation next week with kiddos of all generations, Shirley. Some trees are planted by the waters but this one grew up next to the outhouse. Loved the pictures of Saint Grandma and the children. And there the little square house is in the photo with a hoe propped up against it. I don\’t miss the outhouse very much, but I do miss the lilacs bushes that bunched up around it. \”Saint\” Grandma – yes, I would agree! What a lovely story. I also think it would make a great picture book. When my dad passed away 8 years ago, his good neighbour´s family gave us some money to buy a tree in dad´s memory. Trees were a rare and treasured thing on the prairies. We bought a sapling and planted it on the grounds of the local museum. It has grown to be a healthy strong tree giving shade to those who visit the museum. Dad would like that. Now that I think of it, the grounds of a museum as good as the back yard of an ancestral home – in some ways even better because there is a greater audience. Thank you for your affirmation about a book. I think I have my hands full – ha! What a beautiful post, Marilyn. There used to be 2 very tall & thin pine trees that marked the Judge plot – they could be seen for miles. Dad tells me his grandmother dug them up from our woods and planted them there when her husband died. They finally came down in a storm over 25 years later but the stumps are still there. The pall bearers had to be careful when we buried my grandmother at Christmas. Thank you for the \”tree\” story and for mentioning that your oldest child is an arborist – what a wholesome vocation! I know I read this post and even commented about it when it was posted last year, but I clicked on it again. Now it means even more to me. Thanks for spreading the inspiration from our natural world. And your children for generations to come will thank you for keeping the flame of family alive in your wonderful posts. Marian, your story is lovely! Trees are very important to both Bill and me. We planted trees when our children were born and try to plant trees for those in our family who pass away. They are such strong symbols of life and fortitude. I remember your blog post featuring the picturesque landscaping around your house – spring flowers and trees. Trees, TREES, yes – stalwart symbols of many virtues. I guess neither of us would shrink at the label of tree hugger – huh! Our grandchildren gave us 4 pecan trees about 5 years ago and they are planted here in our yard and it is fun watching them grow. They were all planted the same time but are different heights. A friend game me a small bush when my mother died in 2005 and it is a great reminder of our friendship and also my mother. I\’m glad you did the soul-searching necessary to recover from the unsettling experience of moving so many times as a child. Being at peace with yourself \”inside and out\” is a great accomplishment. Bertha. Best of all you have trees to show you are grounded now enough to recognize how special they are. Do you remember the refrain of that Sunday School song \” . . . like a tree planted by the water, I shall not be moved\”? What a beautiful legacy and way to remember a loved one! Trees just grow taller and require little attention. If your rose bushes are like mine, there is pruning, fertilizing, but then something special: fragrance and color! Thank you for posting this wonderful remembrance, Fatima! Marian, this story is a treasure and reads like a children\’s book with so many beautiful layers about family, connection to nature, honoring lost relatives. Your lovely photos tell all but your words and quotes round it all out. So nice to meet Great-Grandma Longnecker! I have always loved trees and you show me so vividly why. Favorite trees-the huge maple tree outside my childhood home that provided us with cooling shade in the summer and delighted us with flaming red and orange leaves in the autumn. When it had to be cut down because of disease, we all mourned. I am blessed right now to be surrounded by all kinds of beautiful, lush trees. Tahnk you for this wonderful story. Whenever I see photos of your family in a natural setting on your blog or Facebook, trees are usually part of the landscape. I\’m thankful always for your encouragement, Kathy! What a lovely post! Is this a future children\’s book? It would become a best seller, with you writing and the photo of children and your husband adding his artistry, what a lovely book it would become! Well, another endorsement – thank you, Anita. Now I need a publisher! I love trees I have many on my grounds sad when the one in front of our house had to be chopped down do to being hollow. But God in his perfect will moved it so that three years later I could plant one in memory of our Linda. Weeks after we planted the tree my grandson Demetri told us at dinner that he could never leave our home, distressed I asked why. Since I\’m so hope to be an empty nest😃 . He said because he had to care of Moms tree. Relieved I said oh honey we can always transplant it. We all laughed and assured him that God and the church would always take care of the tree. I love giving trees for housewarmings and in memory of. Wish I would have thought of it when we were in Pennsylvania for Mom. Will make a note to do it when I go back to PA. The story and pictures are beautiful. Your family are blessed that you have such great treasures. Mother was so upset when she heard about Linda. I don\’t think she ever really got over it. Now they are enjoying heavenly vistas together. Maybe on some level they both know about the tree planted in Linda\’s memory. Because Mother\’s house has been sold, we would probably have to do a tree planting somewhere else meaningful. It sounds as though you are in the habit of giving trees. The gift of a tree is a wonderful gesture for a housewarming, something I never thought of. Yes, we know we are blessed as a family and try to pass these traditions on to the next generation. Thank you, Gloria! As always your stories are diamonds …so beautiful . I love Alexander McCall Smith\’s quote \’Tress Are Your Best Antiques\’…so true . I love Alexander …I have read all of his \’Ladies Detective Agency \’ books , have you Marian ?They are so funny , a cuppa , a A.M.S book and a good tree to read it under …fab . I was lucky enough to meet Alexander , last year , at a book festival he was a delight . I had to leave two special trees at my old house , when we moved last year . One was very old apple tree that I have promised my self I will replace as soon as I have a layed out garden to put it in and a Japanese Acer I bought when we first moved there …I have just bought one of those it\’s sitting out side in a pot …awaiting . I\’m glad this post hit the sweet spot for you, Cherry. Yes, I adore Alexander McCall Smith – an attorney who writes charming narratives that can\’t be beat. I have probably read 6-7 of his books, but I like the series starring Isabel Dalhousie, who I think appears in the Scotland series. I\’m sorry you had to leave those two special trees when you moved. You have the right idea though – plant new trees! Marian — I second the motion: MAKE THIS INTO A CHILDREN\’S BOOK! Well, going by the previous comments, you are # 5 or 6 in line with that recommendation. I already have the artist in my front pocket. Now to find a publisher. Oops! I DO have to adapt this to book form first, I suppose. What a lovely tribute to grandparents, grandchildren, and lasting family memories, Marian. The pictures are delightful. My favorite quote–Someone is sitting in the shade today because someone planted a tree a long time ago–seems perfect for this family reunion. All these details and pictures exist because two someones made lives together and started a wonderful family. I\’m taking a guess based on your Brethren family background that you are familiar with the hymn \”Blessed Be the Tie that Binds.\” This tune popped into my mind as I read your comment just now. Thanks, Marylin. What a wonderful tall tree – and lovely memories in those old shots. Unless you are featuring sunsets, your posts usually include a tree or two. Nature is soothing; that\’s one reason why readers flock to your blog! I wouldn\’t have thought of the vivid verb rustle as a metaphor for the impact of trees in nature upon the family tree. Great suggestion, Susan! Blessings to you, Pat. I\’m always thrilled when readers from my old stomping ground show up here in comments. I know you can picture the landscape more accurately than most. Thanks too for reading. What a lovely way to remember a beloved family member. 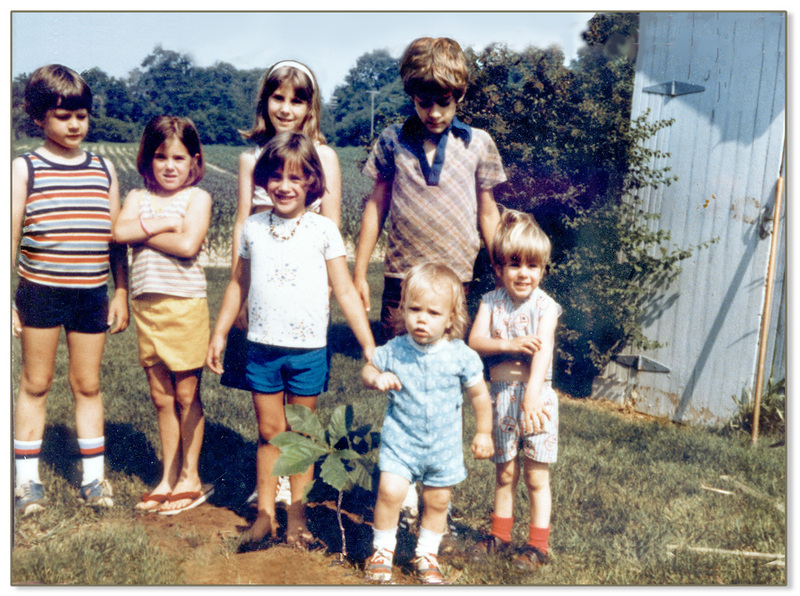 When we lived in Liverpool, New York, we planed some trees in our back yard. It was wonderful to watch them bloom and grow. Tree planting is another way of being a good steward of the land. Anyway, that\’s what I think and obviously you do too. In Melbourne the foliage is vastly different from Liverpool, NY. I never expected to live in Florida, and sometimes even now I do a double take when I see palmettos growing on the edge of the patio. This, alongside an evergreen once growing as a tiny tree in a pot on the desk in my office! I too am enchanted by the generational gatherings and rememberings here. Thank you! I just returned from a week in Alaska with my son, who is a firefighter there. My first impressions of Fairbanks were of the small, but pointy trees along the roads. They may be kept short by the climate, I learned, but spruce trees can often be several hundred years old. I loved seeing and hearing the red squirrels and owls at home in the spruce forests. Beautiful story. It made my heart glad. I love trees. I often find that I come to know them, and visit them, like friends. This morning, I \”met\” a Copper Beech, approximately 160 years old. So many stories she must have been around to witness! The tree planted by the water is one of my favorite songs, (I like Johnny Cash\’s version, as well as the version by Mississippi John Hurt), and also one of my favorite Bible verses. Singing it always makes me feel stronger. Tracy, you refer to the Copper Beech in the feminine and not as a neuter \”it\” But of course! Now I\’ll have to check out YouTube for the Tree song. Your comments always gladden my heart too. Thank you. What a lovely story. We have an apple tree planted in Commamdo Senior\’s garden in memory of his wife April. Two years later he died and we moved the apple tree to our garden. We have little apples on it as we speak. I\’m glad the transplant worked; sometimes it doesn\’t happen so smoothly. Now you have both a memory and a food source here – wonderful, Marie! As I read your beautiful story, I envisioned your sweet great grandmother sitting under the tree. Thank you for sharing with us. I also have a memory of a special tree. My mother, who passed away 9 years ago, had a very large maple tree in her back yard. She loved all the wild birds that visited that tree and nested there. On it she hung several bird feeders. This beautiful large maple tree was also her prayer spot. Everyday, without fail, she would go outside with her bible and stand under that tree to read her bible and say her morning prayers. Her house was sold after her death but the tree is still standing straight and tall. I smile and reminisce as I ride by there frequently just to look at it. Welcome, Rose. Your sweet story matches mine with a strong spiritual core. Grandma read her Bible often but never under a tree outside. I imagine she prayed though as she picked strawberries or sweet corn. Thank you for reading and commenting here. Please come back soon!